The Municipality of Tweed clear bag policy commences July 1st. The policy affects everyone disposing of waste in the Municipality of Tweed including businesses, schools, community halls, and multi-residential buildings. While the transition to clear bags will be an adjustment for all, the long-term benefits to our landfill site will be substantial. Extending the life of our landfill by controlling what we dispose of will have a positive effect for all of us living in the community. The Municipality of Tweed is committed to providing a high level of service when it comes to your household waste, and in order to do so we must transition to clear bags. A transfer station for waste is too costly and is an undesirable option for ratepayers. We are committed to providing a landfill to residents right here in our Municipality for decades to come. Now that you're committed to using clear bags the biggest question you may have is what can I put in it? How many privacy bags am I allowed? What if you can see a pop can or water bottle in my bag? What Can I Put In Clear Bags? Visit Quinte Waste Solutions website, here you will find everything you need to know about what is considered recyclable and what is not. If your item in question is not on Quinte Waste Solutions list then place your item in your clear bag, it is garbage. How Many Privacy Bags Am I Allowed? 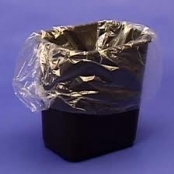 One kitchen catcher sized privacy bag will be permitted inside your clear bag. What If You Can See A Pop Can Or Water Bottle In My Bag? We've all gone and thrown a water bottle or pop can in a garbage can before by accident. We understand. If your clear bag is showing one item of recycling the chances are it will be picked up and/or you will be permitted to access the waste site. Four or five items in a clear bag that should be in your recycling bin are too many. Your bag will be left at the curbside until you remove these items. If you are visiting the landfill site you will have to pay $10 for your bag containing recyclables. We must divert items going into our waste site that can be re-used for other purposes. Think you may need some recycling bins? The Municipality of Tweed sells blue bins at the Municipal Office for $5.00 each. Finally, what constitutes a clear bag in the Municipality of Tweed? Any bag that is transparent is permitted (this includes blue clear bags).